Dr Ian Paisley, (born 6 April 1926), was a senior politician and church leader in Northern Ireland. He was a founding member of and Moderator of the Free Presbyterian Church of Ulster while also Leader of the Democratic Unionist Party (DUP). Paisley was elected Member of Parliament for the constituency of North Antrim in 1970, and has also been a member of the European Parliament. The son of a Baptist minister Ian Paisley was born in Lurgan, County Armagh, but later educated at Ballymena Model School, Ballymena Technical High School, South Wales Bible College, and the Reformed Presbyterian Theological College in Belfast. In 1946 Paisley was ordained to the Baptist ministry. In March 1951 Paisley played a central role in the forming of a new church and shortly afterwards Paisley was appointed as Moderator of the Free Presbyterian Church. It was through his religious activities, based around a fundamentalist brand of Protestantism, that he first came to public prominence. This was further increased with his condemnations of the growing trend of ecumenism between the other Protestant churches and Catholicism. By the mid 1960s he had also emerged as a vociferous opponent of the unionist political establishment accusing it of seeking to betray the interests of Northern Ireland Protestants by seeking to reach an accommodation with Irish nationalism. In particular Paisley was to target Captain Terence O’Neill, then Prime Minister of Northern Ireland, and accused him of weakening the constitutional link with Britain on account of the policies being adopted by his government. This opposition was if anything to intensify after the visit of Séan Lemass, then Irish Taoiseach, to Stormont in January 1965 and led Paisley to launch an “O’Neill must go” campaign. Paisley opposed the emergence of the civil rights movement in Northern Ireland. This led to him establishing two organisations, the Ulster Constitution Defence Committee and Ulster Protestant Volunteers, and these were to be prominent when he began to organise Protestant counter-demonstrations to coincide with civil rights marches. In one instance in Armagh in November 1968 Paisley’s involvement in one of these protests led to his arrest and he was later to serve six weeks in jail. At the Northern Ireland general election of February 1969 he unsuccessfully challenged O’Neill in his Bannside constituency and although narrowly defeated his strong electoral performance, further weakened the position of the beleaguered Prime Minister. His growing political influence was further strengthened in 1970 when Paisley first won a seat in the Stormont Parliament at the Bannside by-election of April 1970 (1970-72). In June 1970 at the Westminster he followed this when he was elected the new MP for North Antrim (1970-present). On both occasions he had stood as a representative of the political party he had established, the Protestant Unionist Party (PUP) but in September 1971 joined with other unionist dissidents to help form the (Ulster) Democratic Unionist Party (DUP). In 1973 he assumed the leadership of the DUP (1973-present). 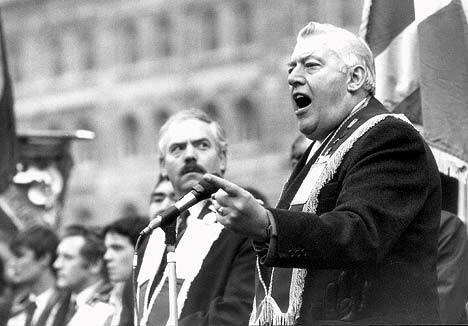 Following the establishment of the power-sharing government under the Sunningdale Agreement in 1974, Paisley took a high profile role in the 1974 Ulster Workers’ Council (UWC) strike which resulted in the collapse of the short lived power-sharing administration. He was elected to the European parliament in June 1979. Throughout the early 1980s the DUP’s electoral contests with the Ulster Unionist Party (UUP) were frequently bitter as both sought to establish themselves as the dominant voice of Northern Unionism. This rivalry was suspended in 1985/86 as both parties combined to organise a campaign of political resistance against the 1985 Anglo-Irish Agreement (AIA). But by the time the AIA was suspended for a period in the early 1990s, to allow for all-party talks involving the Irish government to take place, relations between the two parties were to deteriorate again. Paisley opposed talks to bring about a new power-sharing government following the Downing Street Declaration in 1993.